Locker Room has a new outfit! The new bottle is now a little wider and allows you to enjoy a better and faster effect. This fantastic aroma hides some great emotions that will stream out of the bottle and seduce your senses. 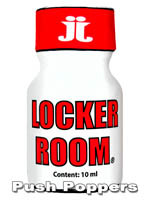 Locker Room contains 10 ml of guaranteed orgasms.